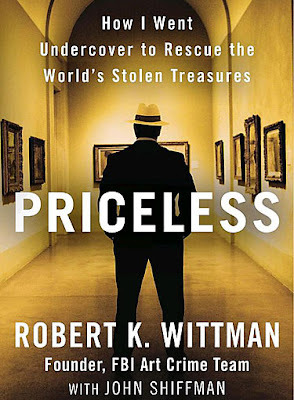 Inside Stories: BACK STORIES -- FBI ART CRIME SPECIALIST ROBERT WITTMAN'S BOOK "PRICELESS"
BACK STORIES -- FBI ART CRIME SPECIALIST ROBERT WITTMAN'S BOOK "PRICELESS"
I just read the most thoroughly engrossing memoir: "Priceless: How I Went Undercover to Rescue the World's Stolen Treasures," by Robert Wittman with John Shiffman. Before going into the art security business in 2008, Wittman was for 20 years an FBI special agent, going undercover around the world to retrieve important cultural artifacts such as an African American regiment's Civil War battle flag, a Rodin mask, a Rembrandt self-portrait, a headdress worn by Geronimo, and others. Pretending to be an art or antiquities dealer, Wittman would ingratiate himself into the worlds of the gangsters, con artists, black marketeers, and other shady characters who'd obtained this stuff (illegally, of course). And he goes without a gun. This is one cool customer! I learned some important pointers about creating a back story, if I should ever need to go undercover on short notice, and without any training. As I say, Wittman's back story was usually that he was a Philadelphia art or antiquities dealer in the employ of a buyer whose identity he couldn't reveal. You may not need the most elaborate back story, but you should be convincing in your role. A few Wittman tips. First, master whatever realm you're working in. Since Wittman worked with cultural treasures, he had to study art history and other subjects. In the case of the battle flag, Wittman made clear to his target that he'd traveled the Civil War collectors' circuit. Second, use your real first name and then come up with a common last name; your real first name so you don't have to train yourself to respond to something new, and a common last name so that none of the criminals you'll be dealing with can easily discover that you're not who you say you are. Wittman used the name Bob Clay. I might point out that this step is tougher for people with unique first names, or unusual one-word names like Sting, Seal, Twiggy, McLovin, or Cher. Though there are reasons besides their names that celebs such as Cher would have trouble going undercover. Third, share information about yourself to win your target's trust. Wittman advises, "Stay as close to the truth as possible -- don't say you have six kids if you only have two, because somewhere along the line you're likely to screw up." It's like they say: the more lies you tell, the better memory you have to have, to keep all your deceptions straight! "It's important to get into a role," Wittman cautions, "but be careful, stay sharp. When you work undercover, it's easy to lose touch with reality and let the lies and deception take over. ... Above all, you've got to be comfortable in your role. It's got to come from within. Remember, I tell the agents I teach: You've got to be yourself. Don't try to be an actor. You can't do it. No one can. Actors have scripts and multiple takes. You only get one. They flub their lines and they get another chance. You make a mistake and you can end up dead -- or worse, get others killed too." Even if you're not planning to become an undercover agent, "Priceless" makes for fantastically entertaining reading -- not unlike a true-life Thomas Crown Affair. There is an unnamed Hollywood starlet who helps out on cases (okay, so much for my Cher theory), a choreographed yacht ride off the coast of Miami meant to seduce their targets, and plenty of European intrigue. Consider one case that takes Wittman to Madrid: "Tomorrow, if everything went according to plan: I'd be entering another hotel room across town. To meet a desperate, possibly homicidal gangster eager to close a $10 million deal. Unarmed. Dangling a million euros cash as bait. Working with an FBI partner on his first undercover case. Negotiating in French, a language I didn't understand. Swell." Perhaps Wittman does to the reader what he does to his targets: ingratiates himself, demonstrates his knowledge of the field, builds rapport, shares personal information. Only the difference is that, unlike his criminal targets, we don't get betrayed and arrested in a sting operation at the end! Unless, of course, you stole the book to begin with. In which case, don't be surprised to find a g-man knocking on your door.